Hop flavors are moderately high and floral to citrusy. The malts add complexity and give the beer a pleasant flavor, a golden color, and support the hop aspect. So, take a hike! If you love the smell of the woods after a fall rain, let our English India Pale Ale (IPA) take you there. The only thing missing are the bugs! Another big, huge thanks to Wil for a couple of these guys! 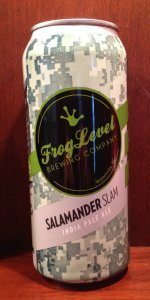 Salamander Slam is vibrant orange with a touch of haze running throughout. A large bubbled, dirty white head settles comfortably at a finger in height and surprisingly leaves behind large bubbled lacing in drink lines. carbonation rushes to the surface from what seems like every point of the glass. The hop profile is diverse and balanced. Orange and grapefruit, both pithy, are first noticeable before being met by a healthy dose of bitter greens. Candied citrus peel shows up toward the back with herbal notes following, again, all in balance with each other. The malt base is interesting as well, freshly cracked grain and toasted white bread make up the malt base. It's course and rough around the edges and I rather enjoy that. That graininess really comes through in the flavor, freshly cracked, with the lightly toasted white bread maltiness. Pithy citrus again but the bitter greens are met by an aspirin bitterness in the middle. Citrus is bright on the backend; orange peel, marmalade, some more of the pith. Again, it's diverse yet well balanced and complimentary. Nicely done. The body fits just about perfectly. It's moderate in weight with a perfectly tailored carbonation, producing a velvety yet quick moving libation. Bitterness lies squarely between light and moderate. The finish dries up slowly and drinkability is sky high. Me likey. I stopped at a bar in Charlotte that had all NC beer on tap, 30+. I asked them what they would drink. Both mentioned this beer being up toward the top of the list.They steered me in the right direction. It's good, it's very good. The hop profile covers a lot of areas and I enjoy the graininess of the malt base. I wouldn't hesitate in buying more. A: Pours a very lightly hazy medium golden honey in color with light to moderate amounts of visible carbonation rising from the bottom of the glass and hints of copper + apricot highlights. The beer has a two finger tall foamy off-white head that reduces to a thin film covering the majority of the surface of the beer and a medium thick ring at the edges of the glass. Moderate amounts of lacing are observed. S: Moderate aromas of citrus/orange rind and floral hops over the top of pale, grainy, and caramel malts. T: Upfront there is a light to moderate flavor of pale, grainy, and caramel malts with just a hint of sweetness. That is followed by light flavors of floral and citrus/orange rind hops which imparts a light to moderate amount of bitterness which fades fairly quickly. M: Just shy of medium bodied with moderate amounts of carbonation. Light amounts of dryness int he finish. O: A decent IPA but nothing special, easy to drink and refreshing. I'm not sure that I would grab it again but it certainly was not offensive - there are just a lot of better NC options available at the same price. pours a hazy orange golden color, thick creamy head. good lacing. very nice big fruity hop aroma - very citrusy. taste is dominated by the same very pleasant flavors - just enough malt to balance. no bitterness. nice smooth feel. overall a very good beer. Hazy copper pour, with a bubbly white head that retained as a ringlet. Floral and citrus notes in the aroma that were reflected in the taste, pretty light and crisp with a lasting bitterness, and a solid crackery malt base. Body was about medium, perhaps lighter than you'd expect for a 7% brew, but in this case, I'd say it was a good thing. Simple, refreshing, and drinkable. A - pours a hazy copperwith a great finger of light tan head. OK retention and lacing. T - Perfectly consistent with the nose. Decently bitter. Finish is sweet citrus rinds and dry bitterness. Aftertaste is consistent with the finish, mostly bitters linger. Mini growler bottle? Pretty handy little thing. Makes you want to chug chug chug. T: Not overly hoppy. Some bittersweet flavors with a fruity finish. M: Decent carbonation, with a dry finish, good body. O: Overall, I like it, but I think I like the bottle more than I do the beer. This will be a handy one to keep around and pour from my kegs. Poured from a tallboy into a shaker pint, the beer is a hazy, muddled, brown coloring with a filmy, low profile, white head. Aromas of tangy caramel, tart citrus, sweet tropical fruits, and bitter resinous hops notes. Flavors are tropical fruit forward, with pineapple in the spotlight, and a tangy toffee and caramel backbone. Hints of pine and dank hops bitterness, with floral highlights, bubble gum sweet, and a citrus blast of grapefruit and tangerine at the end. Effervesced feel from the carbonation, with a citrus tart and bitter aftertaste. Dry, slick, slightly astringent finish. Not bad. I'm trying this at my Bestie's in Charlotte. It poured a clear copper with white head that is leaving a spotty lace. The scent had hints of sweet malt and hop bitterness. The taste was nicely balanced and easy to drink. Malt and pine presence. The mouthfeel was medium in body with good carbonation. Overall it's a good beer. Poured into a Due South Brewing Co. snifter. No freshness date. A- Pours a somewhat murky dark amber color with a 1/4 inch off-white head that doesn't retain long before becoming a paper-thin ring around the edge of the glass and nearly no surface foam. Not-so-resilient lacing leaves tiny specs behind. S- Surprisingly bright given the appearance with some mild citrus notes and a toasty malt character. After some short sharp sniffs, a vegetal kind of green pepper quality comes through. T- Innocuous flavor of toasty malt and faint hops. Next to no bitterness or even really any hop flavor at all. The hop flavor that is there is vegetal and unappealing. Easy to drink but no fun at all to do so. M- Also a letdown. Limp, low carbonation. Body is leaning toward the lighter side. O- Jeez. Either I got a bad can or this beer is not good.. One of the worst IPAs I've had in a while. Very average and uninspired, even for an English take on the style.